One of the greatest things about summer is the availability of fresh produce. Whether grown in your backyard or bought at the farmer’s market, nothing tastes better than earth-grown, sun-kissed, fresh-picked fruits and vegetables. For Mother’s Day, my husband and kids gifted me a spiralizer, aka spiral slicer. As one who loves new kitchen gadgets, I had been giving hints, and my husband finally figured it out (no, let’s be honest: I bought the thing myself and told him to give it to me). Now we are starting to take some of that delicious, fresh summer produce and make fun and inventive dinners and dishes that both kids and adults will want to eat. 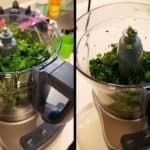 What Fruits and Vegetables Can I Use on the Spiralizer? There are so many options of healthy foods you can use with a spiralizer. The spiralizer works really well for any fruit or veggie that is firm enough to withstand the pressure of the blade. For example, an apple works really well but a tomato would just make a mess. The most popular food to spiralize is zucchini. Zoodles, anyone? It makes fabulous noodles that are so easy to replace in any spaghetti dish. Other common fruits and vegetables to spiralize include: apples, pears, carrots, butternut squash, cucumbers, potatoes, sweet potatoes, cabbage, jicama, bell peppers, beets, rutabaga, onions, and parsnips. As already mentioned, zucchini noodles work great as a substitute for pasta, as does butternut squash. 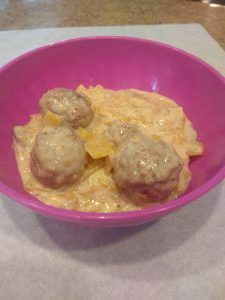 My husband has raved about the beef stroganoff I made using butternut squash instead of egg noodles (see recipe below). He is wanting to lose weight and is very excited about switching out some of his daily carbs with fresh vegetables. 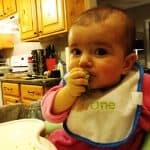 My young kids haven’t been too keen on eating my zoodles and meatballs (yet); however, replacing ordinary pasta with vegetable noodles may be a way to get your kids excited about eating more veggies. The spiralizer is also a great tool that can be used every day for simple slicing tasks. Want to make coleslaw? Spiralize your cabbage in seconds. Want thinly sliced cucumber for a salad? A cucumber ribbon will not only taste good but look beautiful. Use the thick julienne blade to make curly fries and the ribbon blade to cut apples for an easy apple pie. There are endless possibilities to the creative dishes you can make with your spiralizer and for your family. There are many different varieties of spiralizer–handheld vs. tabletop, manual vs. electric, etc. When considering the veggie spiral slicer for you and your family, I think it best to consider ease of use, what foods you think you will be using it for, storage space and options, and quality of product. From small and easy to big and hefty, the reviews below will help you decide which is the best spiralizer to buy. The most basic of the spiralizers, this handheld version is very compact and small. Due to its size, it is very easy to use without having to figure out which piece goes where. 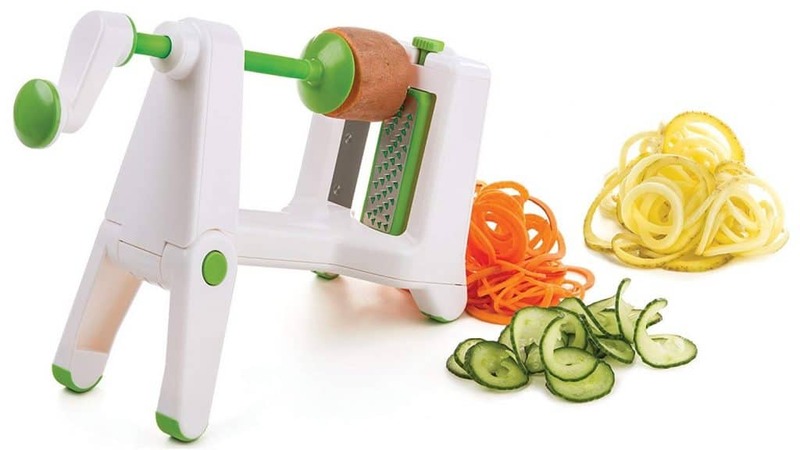 The Good Grips Spiral slicer cuts zucchini, cucumber, and potato curls easily. Cleaning is a breeze, as it easily comes apart and can be placed in the top rack of the dishwasher. The veggie grip becomes a lid and keeps this little gadget safe to store. This OXO spiralizer no-frills version is small and takes minimal space. However, as it is a manual device, your wrist may tire after spiralizing a large quantity of vegetables. The tube is only so large and only the right size of vegetable will fit. I find this spiralizer very simple to use. The handle turns smoothly and is easy enough for my three-year-old to use (with supervision, of course). I love that it sits on the table and is very easy to manage. The feet grip the table, yet it is easy to move about the kitchen. It is simple to switch between the three blades, and they are very sharp and work well, for both hard and soft foods. 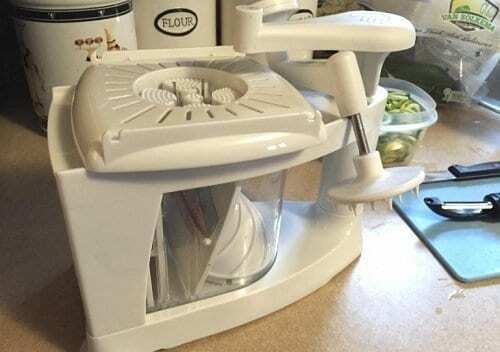 Although a very basic machine, this spiralizer does not come apart. If washing by hand, it is a little tricky to clean about the blade area. For the same reason, it is a little difficult to store this device safely other than in a box. While it cuts most food perfectly, the plastic food prongs do slip on some foods, causing the machine to not cut well. Brieftons has updated their latest model and now offers a seven-blade spiralizer. While some feel that seven blades may seem superfluous, others enjoy the variety of cut options. The greatest feature of this unit is that it can be disassembled for cleaning and all blades are encased for safe storage. It is very easy and effortless to use. It is of high quality, as evidenced by its ability as a spiral slicer to cut larger and harder vegetables. While the gadget does store safely, it is still a bit bulky and will take up space in your cupboard or on your counter. While all parts of the unit work well and are of good quality, the side handle used to advance the food forward can seem a bit awkward. The Mueller spiralizer is different in that it has a vertical rather than horizontal design. This allows for simplicity as the user pushes down instead of sideways to advance the food. The four blades and extra attachments help this unit to serve as multifunctioning. It disassembles for easy cleaning and storage. You have to assemble the unit before using it, so first-time use can be tricky if not assembled correctly. Also, the instructions are lacking and are unclear. The unit is easy to use after some practice and correct assembly. This electric spiralizer does a lot of work with minimal effort. 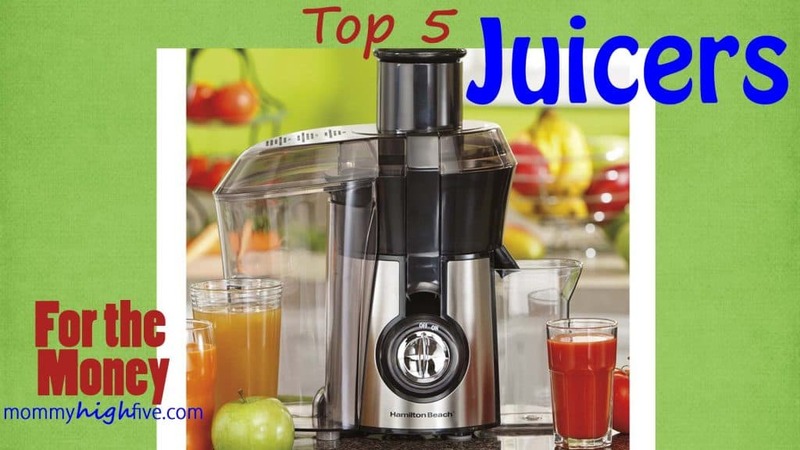 The machine will work for you as your fruits and vegetables are spiralized in seconds. The large 5 cup capacity bowl means there is no mess and easy clean up. The unit comes with three blades which allow you to make spaghetti, fettuccine, and ribbon style veggie noodles. From curly fries to zoodles, the Gourmia will not disappoint! The KitchenAid spiralizer attachment will not only spiralize, but also core and peel your vegetable as well. Firmer vegetables work best and the machine makes light work of foods. The attachment and blades have their own case, making storage easy. 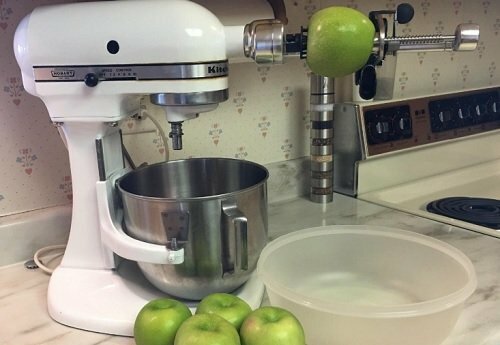 You must have a KitchenAid mixer in order to use the spiralizer attachment. It can get a bit messy if a bowl is not used to catch the spirals and peels as they fall from the machine. Be prepared to spend a little bit more for this spiralizer and the mixer if you do not already have one. What Does a Spiralizer Do? The spiralizer is a handheld or small tabletop spiral slicer that cuts and spins vegetables into thin ribbons or julienned noodles. Most Spiralizers come with three basic blades (the thin julienne, thick julienne, and ribbons) and may include additional blades, and are either manual or electric. How Does a Spiral Slicer Work? To prepare your food for the spiralizer, wash all fruits and vegetables properly, and, if desired, peel any foods necessary. The spiralizer will include the peel in the curls if left on, so if you do not want the peel, remove it beforehand. Many spiral slicers will instruct you to cut a flat end to your fruit or vegetable so that sits better in the machine. Follow the specific instructions for your machine to spiralize your food. 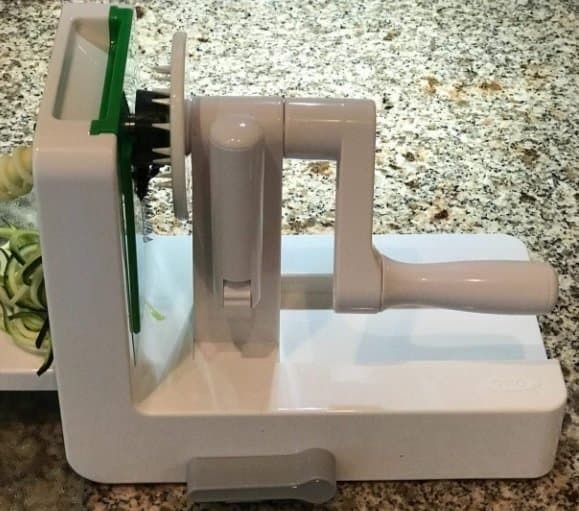 Simply center your vegetable on the nob at the blade end of the machine and push the handle forward until it grips the other end of the vegetable. Using a circular motion and applying slight pressure, turn the handle and advance the vegetable forward. As the vegetable turns and advances, the blade will cut, or spiralize, the vegetable, leaving you with beautiful, long curls. You may then eat your spiralized creations raw, sautéed, boiled, baked, fried, or any way you please. Cook ground hamburger in frying pan on medium heat. While meat still slightly pink, add onions and mushrooms. Sauté until vegetables are soft. Add paprika, pepper, salt, and bouillon paste. Stir to distribute. Reduce heat to medium low. Add sour cream, 1 cup milk, and half and half. Allow to reach slow boil. In a small bowl, combine cornstarch and 1/4 cup milk to make a slurry. Slowly add slurry to pan while mixing to thicken sauce. Bring a pot of water to boil. Add butternut squash ribbons and cook until fork tender. Drain. Serve sauce on top of squash for a delicious, no carb dinner. Spiralizers are a great way to get your family eating healthier this summer. Consider if the kids will be helping and what types of foods you will be eating, as well as how you will store the gadget and the quality of the overall product. For an electric spiralizer, we recommend the KitchenAid Spiralizer Attachment. We recommend the Briefton 7-Blade Spiralizer for a manual spiral cutter. Now, get the kids in the kitchen and get spiralizing! 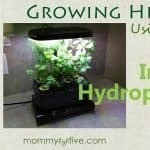 For another heathy eating option check out our best budget food dehydrators or kitchen hydroponic kits.